Here is the first doll's quilt I've made from the book Childhood Treasures. It's just the cutest thing. It was the first thing I did Friday. The photo is a little misleading, it's a very small quilt even by my standards. It measures approx 9 x 13 inches to give you some idea. I'd like to say that I've deliberately sewn it a little wonky but the truth is I was in a hurry to finish it. I think it adds to its charm. As a child I remember wet Saturday afternoons going through Mum's hanky box. This box was full of lovely handkerchiefs in varying sizes, fabrics, designs, none of which were ever used. I thought Mum was saving them since they were so beautiful but now I realise they were totally impratical! Remembering the enjoyment I received from such a simple past time I've decided to do something similar but with doll quilts instead. This is not to be confused with the stack of little quilts I said I was going to make at the start of the year. This is another collection I plan to start working on. I'm already planning the next one. It will have to be the schoolhouse, p 87; since I've already bought the fabric. 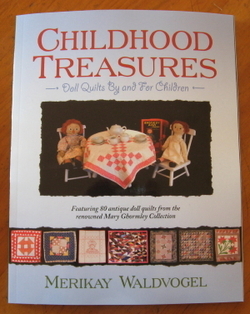 Now I am very excited about making quilts this year, and I've found the two books, both named Childhood Treasures by Caroline Zoob and Merikay Waldvogel respectively, very inspiring. Caroline's because it talks about making gifts for babies and young children and Merikay's since its all about "Doll Quilts by and for Children"
So when I started thinking about a gift for my new niece, Keileigh, it was very clear it would have to be handmade and a quilt. Out came the pretty scraps. It measures approx 18 x 21 inches. Now I would have liked to finish it today, but can you believe it, I don't have any fabric for the backing; well none that I like for this project. Well it feels like it must be Christmas or my birthday or something as I have now received all three books I ordered. The first to arrive was Childhood Treasures by Caroline Zoob. The chapters on stuffed toys and painted wooden toys evoke memories of my childhood. I'm not sure how it happened but the knitted toys and wooden clowns made for us were damaged and lost over the years. Next to arrive was the new Blackbird Designs book. 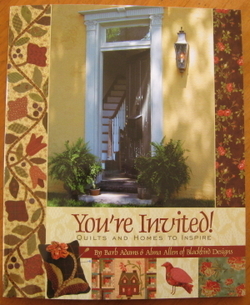 Australian designer Yelena Elliot has one of her quilts featured in this book. It's a beautiful quilt and I am very tempted to make it. The page I keep being drawn to though, is of the samplers in Joy's home. Now I have a wall just crying out for this sort of attention! And the last to arrive was Childhood Treasures - Doll Quilts By and For Children. There are no patterns in the book just beautiful pictures and inspiring narrations. Now there were at least six quilts I needed to make immediately last night. It was just that I couldn't decide which one to make first! Jan & I have already picked out fabric for one of the quilts but I promised her I'd work on my business related projects and the challenge quilt before starting the quilt. If you have this book the first quilt we've decided to make is the Nine-Patch on page 56. Some promises are very hard to keep! There is only one good thing about the week flying by; Friday comes around sooner and I'm sewing with the Friday Girls again. They've all been so busy and creative over the past couple of weeks. Helen has been working on this lovely quilt designed by Susan Smith, Patchwork on Stonleigh (sorry I've forgotten the quilt's name). 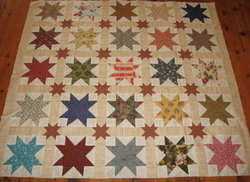 Helen, has used the Fat 1/16's from the Patchwork on Stonleigh Fabric Club for the large stars. Don't they look fantastic! Helen's making this for a wedding present. 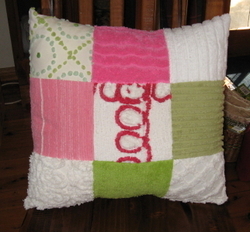 Jan made this gorgeous chenille cushion from fabrics purchased last year (or maybe the year before) from Sarah London. These fabrics and the backing fabric all came from her stash. Much too beautiful to have hidden away in the cupboard. Brownyn enjoyed making Jan's Spot the Yo Yo quilt so much she's made three! All in different sizes and fabrics. How stunning is this! And all finished now. Bronwyn stitched the binding down on this quilt and another small quilt. But I think Michelle was the most productive. Not only did she serve up a scrumptious lunch she started and finished this bag. Yes, some of you will recognize it. You know how it is. Sometimes you see something made in certain fabrics and its hard to imagine it in anything else. 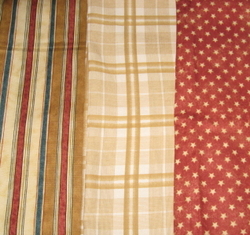 And this City Girl fabric is gorgeous. 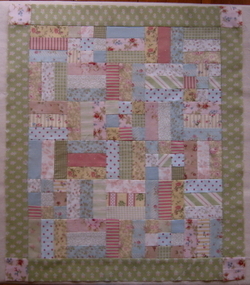 The lovely green buckle, from Jan's stash of all things beautiful, is just perfect. Michelle is not keeping the bag. It's a gift for a very special Aunts 60th Birthday. My To Do List is getting longer and longer and some items should have already been started, but yesterday all I could think about was finishing the new quilt top. 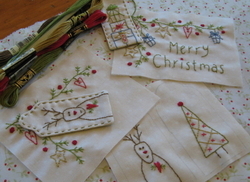 All the fabrics, except for the red used in the border, have come from the scrap bag. 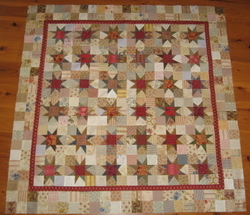 And the red was left over from another project so I guess it is a scrap, just a large one! 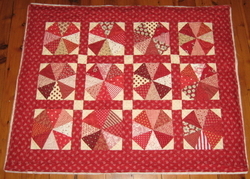 I love it with the red and pieced borders. All it needs now is the red binding. I found these fabrics in the stash and think they will be perfect pieced together for the backing. I'll do this sometime...... because now I really need to get back to working on the quilt for the challenge. Did I mention it needs to be completed by July. That's quilted and bound - I won't get away with just the top finished. 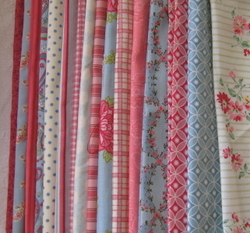 And I just love these fabrics. Nothing like the ones above. Yes, you were all correct (except for non-conforming Cathy), my new bag is the red one. The lucky winner of The Garden Sampler pattern is Sylvia. Sylvia if you could please email me your address I can post the pattern to you. Thank you to everyone who entered. I never realised there were so many following my blog. With three new projects all vying for space on my table I decided one of them needed to be finished. And I opted for this one. The stars that Kathie inspired me to start and Bonnie showed me how to make. All the fabrics have come straight from the scrap bag. 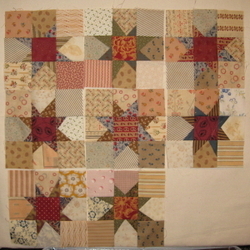 The blocks are 6 inches finished, making this a small lap quilt. Now you would think after all the cutting and sewing ( I estimate I've used between 1.5 and 1.75 metres) the scrap bag would be looking a little emptier. Ah, NO. There is no noticeable difference! So just how many metres do I have? After this, I decided to sew the blocks together as quickly as possible. Azzy doesn't realize how lucky he is that we love him! About 2 1/2 years ago I attended a workshop run by Christine Book. If you've ever done a class or workshop with Christine you'll know just how much fun they are. 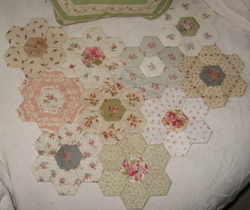 One of the things that really inspired me was Christine's tin full of hand pieced hexagons. Beautiful fabrics with many of them fussy cut to create gorgeous borders and patterns. Needless to say I couldn't wait to buy the papers and get started. And for a time the only fabrics I was interested in were those that could be fussy cut for hexagons. This is as far as I got! For anyone who has never made hexagons, there is a lot of work here in just these few. This is not a 'quick' project. I proudly display this effort on a small side table with a box strategically placed to make it look a little more symetrical. Too much work has gone into this piece to have it hidden away in a cupboard. I was so over hexagons I gave the rest of the papers away to Bronwyn. This quilt is in the book 'the Quilter's resource book' by Maggi McCormick Gordon, p 96. I love the border and would have done this, had something a little bigger and probably finished by now. Unfortunately, I purchased the book after sewing them together. 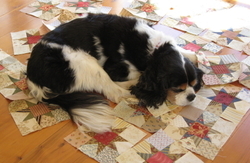 Last Monday, after a chat withJan, I found myself inpsired to take part in the Murray River Quilter's Quilt challenge. The challenge is a row by row quilt with a letter representing each row. I have never done anything like this before and know the names of about 3 blocks, so how hard could it be? The letters are P,S,C,T,F,L and H.
H is for Hourglass, Hexagons..... Well, you can see what I decided to go with. And it gets better, this time around I'm using the 1/2 inch papers. My family have always thought I'm a little mad and I'm almost to the point where I could find myself agreeing with them. 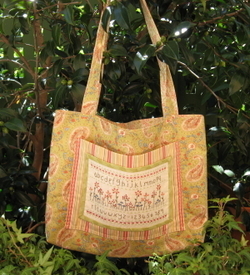 Today is your last chance to enter the draw for a copy of my 'Garden Sampler' bag. See the previous post for details. Sewing was at my house yesterday. Sue-Anne turned up with a beautiful new black handbag, which prompted Jan and I to recall handbags we'd seen and reluctantly decided not to buy. Now there's nothing like a friend with a new handbag to make you want one as well, especially if you've already got one picked out. As soon as they left I hopped in the car and went straight to the bag shop and Jan did the same thing. Jan's is the tweed bag and was asked a number of times at quilting today if she had made it. These were not our only purchases. 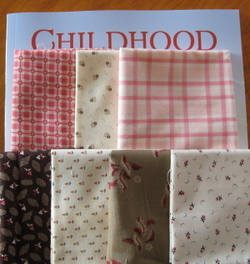 Kathie mentioned a book called Childhood Treasures: Quilts by and for Children, and before we knew it Jan and I had both placed orders for it. 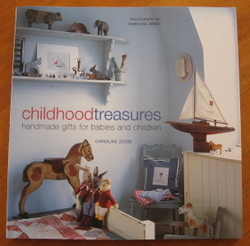 But there's more, we also spotted the book Childhood Treasures: Handmade Gifts for Babies and Children by Caroline Zoob. We've all wanted this book for awhile now, so yes, in went the order for three copies. I don't think we should sew at my house again! 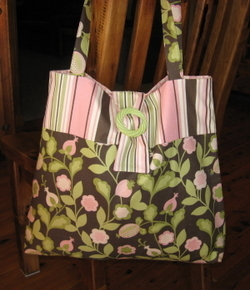 During the week I finished the pattern for my bag "The Garden Sampler". I have a copy of this pattern to giveaway. 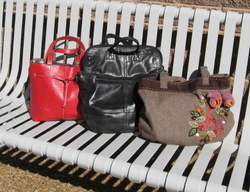 To enter the draw, simply post a comment telling me which is my new hand bag! The draw will close next Saturday 12 April. This is the first scrap quilt I ever made (and the second quilt I ever finished). The pattern was in Australian Country Threads Vol 2 No 19 and was designed by Belinda Merritt (Phoebe Rose). It's not a large quilt, approx 40 inches square but is the ideal size to fold in half and drape over the back of a chair. It's still one of my favourite quilts, I think due to the large number of fabrics used. And they were all scraps. Apart from the binding and the backing not one piece of fabric was purchased. I look at it now and wonder just how many dolls I must have made to have all these scraps left over. So where is all this leading. Well I have started another scrap quilt. 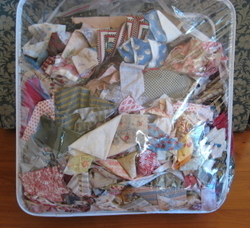 This is my bag of scraps: pieces of fabric in all shapes and sizes, some still loved and others - well lets just say I cannot wait to see the end of them. Now it doesn't appear like a lot, but looks are deceptive as I discovered last night when I pulled it all out onto the floor. My aim is to make a quilt using only what's in this bag. These scraps have to go. Now I have been reading Kathie's blog. 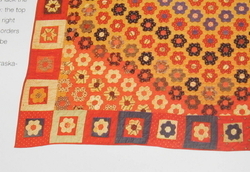 If you want to be inspired with some wonderful reproduction quilts then pop across and have a look. 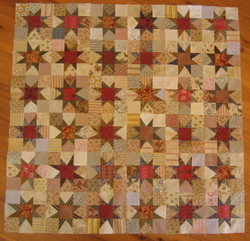 Kathie's been making a quilt with scrappy stars that Bonnie posted a tutorial for. And here's what I've done so far. 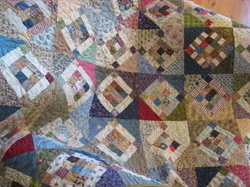 Now I can't help myself, but I think scrap quilts have to be a little controlled with colour or something. By accident, because I was making my first block late Saturday night, and wanted (needed) to see how it would go together, took a shortcut and only picked two fabrics for the star points. I alternated the fabrics, but then when I made the next block I wasn't paying attention and ended up with the fabric any which way. I like having the two colours for the points rather than all different fabrics although once the blocks are finished there will almost certainly be one or two with various coloured points. I love that the points are not perfect, but find myself having to work at 'getting this look'. Will it be possible to only use fabrics from the scrap bag? I'm not sure, I'm already fighting the temptation to go in search for a few lighter backgrounds, different reds....I'll ask Jan. I'm very excited as a few weeks ago Jenny, from The Stitchery in New Zealand, asked if I would like to design a project for the stitchery retreat she's holding in September. I was even more excited when I discovered it was a Christmas theme. Here's a snippet of what I've started working on. Now I just have to decide what to do with them. It's difficult to say what I'm happiest designing and making but Christmas decorations are very high on the list. These are going to be quite special whether your making them for yourself or as gifts.